We are a small, privately owned business that these ASA resin post caps in the USA, and we’re proud to offer retail customers, contractors, and anyone buying our fence post caps in bulk, a broad selection of the highest quality post toppers on the market. These caps slide down the post 1.5" and are 7.5" at their widest point. Made from high impact, remarkably sturdy ASA resin. The same material used in automobiles! Cedar-color is a reddish-brown color, and we use this term to distinguish the color from the brown(formerly known as mocha brown). Our cedar-colored 6x6 post caps are made of ASA resin, a hard plastic that is used throughout the car and marine vehicle manufacturing industry. The material is prized for many reasons, including its UV and impact resistance. Our ASA resin post caps will never discolor, fade, or warp, and we back that contention up with a 10-year warranty (on ASA resin post caps) against fading, discoloring, and warping. ASA resin is stronger and more durable than wood fence post caps because it isn’t subject to recurrent episodes of shrinkage and expansion because of fluctuations in the humidity level. The inevitable result of alternating instances of contraction and expansion is weakening, and that’s what happens to wood. Our post caps cost far less than comparable wood products. They are maintenance free and long-lasting, too. 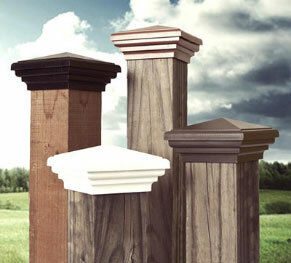 Our cedar-colored flat top 6x6 post caps come in two sizes: Nominal (Standard,) and Actual (True.) Posts bearing the nominal label were cut when the wood was green (undried.) Before there were high-tech machines that allowed lumber mills to dry wood quickly and saw boards to any size with near-perfect precision, wood was cut into posts before it underwent drying and finishing. This somewhat backward wood processing system produced wood posts that were about a half an inch smaller on all sides than they were when pieces of green wood were cut to size. Nominal (Standard) post caps will fit posts with measurements between 5.5” x 5.5” and 5.75” x 5.75”. Actual (True) fence post caps will fit posts whose dimensions are between 6” x 6” and 6.25” x 6.25”. Our patented SNAP-CAP installation system simplifies the installation process. Our two-piece post caps consist of a sleeve that slides one 1½-inches down the post. The second part of the post cap is the topper. The base piece is screwed to the post, and once the post caps are snapped into place and installed, the screws never show.